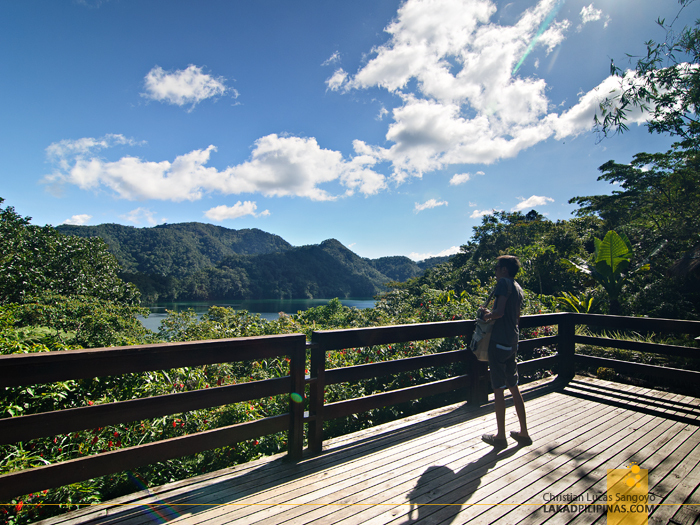 The calm aquamarine waters of Lake Danao sprung into view after climbing a snaking stone stairway surrounded on all sides by the cool shades of whispering trees. 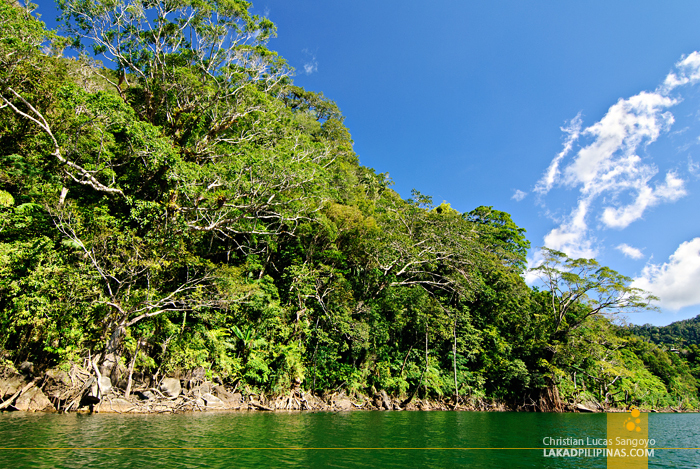 It led to the ridge separating its twin, Lake Balinsasayao. After an hour of traveling from Dumaguete City, we were finally right in the middle of the famous Twin Lakes of Balinsasayao. Our group has previously disembarked on a small placid body of water on the way to the National Park, thinking it was already part of the twin lakes. Although the place looked real nice, we were incorrect in our assumptions. It’s but just a pond, the Kabalin-an Pond to be specific. We did the next best thing though, use the comfort rooms located on the gazebo beside the two-heactare pond. A few minutes more of drive time and we were again alighting from our van and into another gazebo, a much larger one this time. It’s the Twin Lake’s dining hall. We availed of a few snacks and drinks to satiate our thirst before proceeding towards its wooden deck that gave us a preview of what was to come. 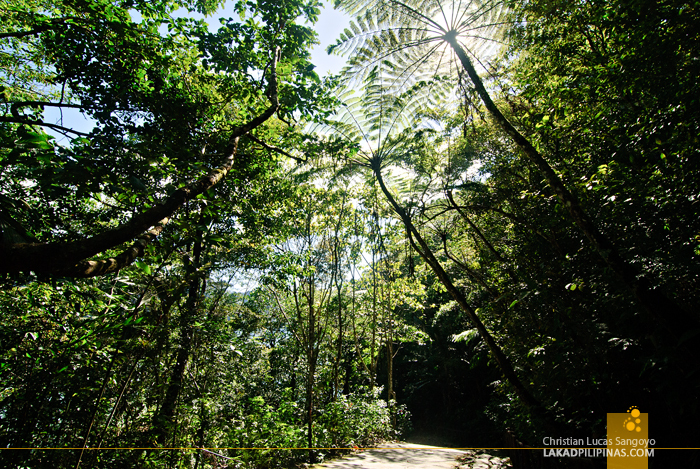 Although the road leading to the first lake was lushly covered with natural growth and felt like a park, the walk towards it was not. The narrow winding path plummets down to unnatural angles, it was hard going downwards but I can just imagine how much harder it must be to negotiate this road on our way back. 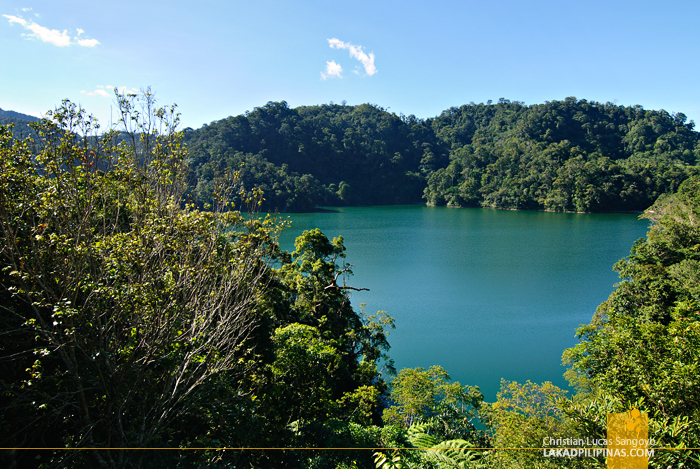 At last, after sweating the downhill hike, we finally saw the green lake of Balinsasayao. Paddle boats, makeshift rafts and kayaks line its gravelly banks. Boatmen immediately approached us for our ride to the second lake on the far side of the water. Our boat silently glided over the calm waters of the lake. The sky was cobalt blue with a few wisps of clouds moving with the gentle wind. 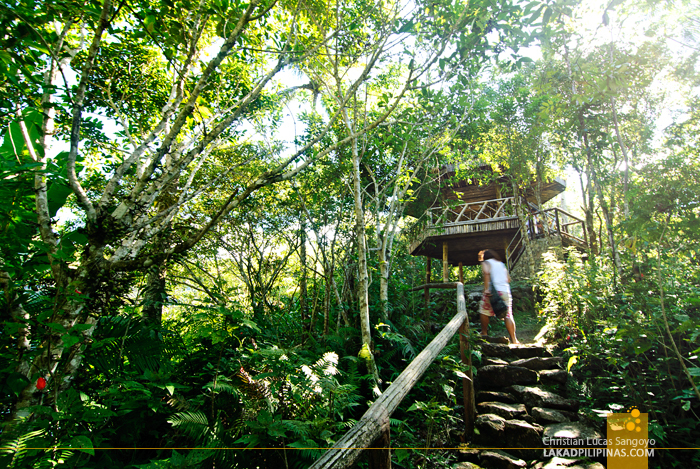 Everyone was quieted by the serenity of the surroundings with only the calls of birds nesting over the dense jungle interrupting our reveries. 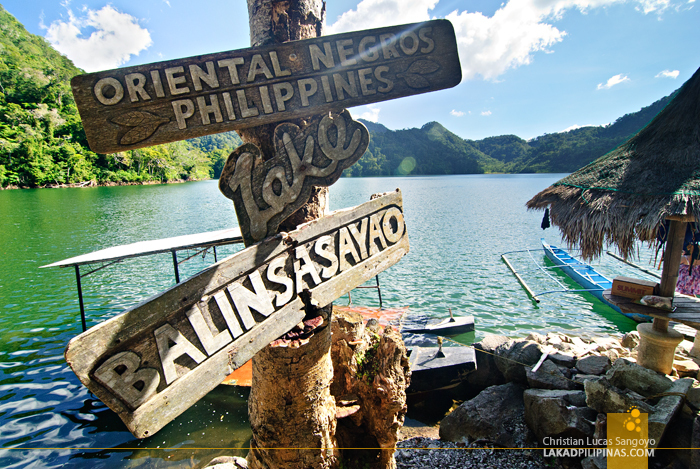 The lake is after all named after the famous balinsasayao bird. 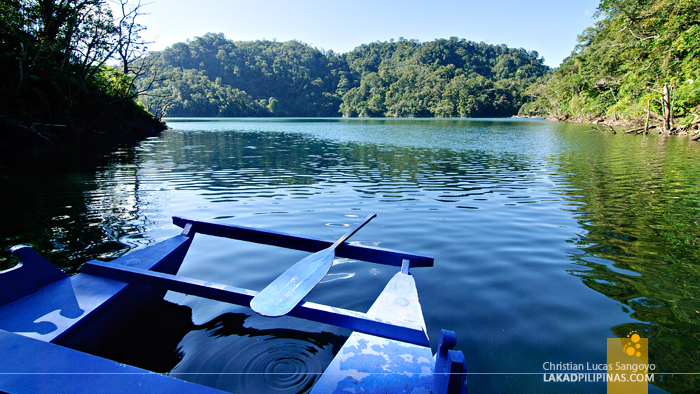 The twin lakes, forming an area of 8,016 hectares, are formed on two deep crater calderas surrounded by four mountains; Mount Mahungot, Kalbasan, Balinsasayao and Guintabon. What’s interesting here is that these bodies of water are a thousand feet above the sea. Visitors are allowed to fish, kayak and swim on both lakes since the surface are usually very placid throughout the year. Uneven stone steps greeted us on the other side of the lake. It was another hilly upward hike before the trail plummets downward once again. 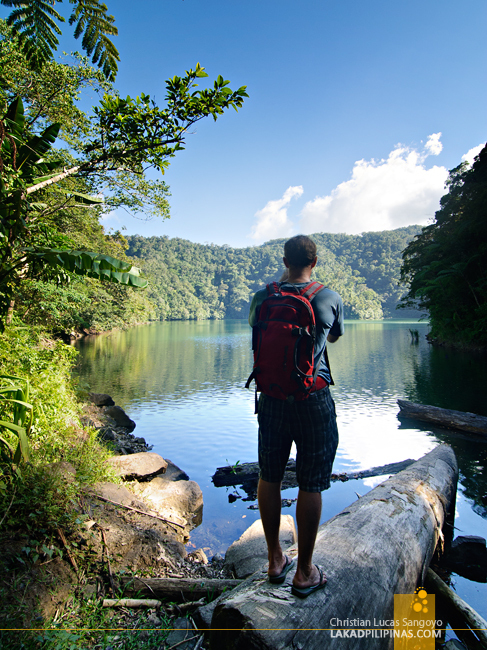 We rushed down, excited by what lies ahead and a few minutes later and we’re treading along the banks of Lake Danao. 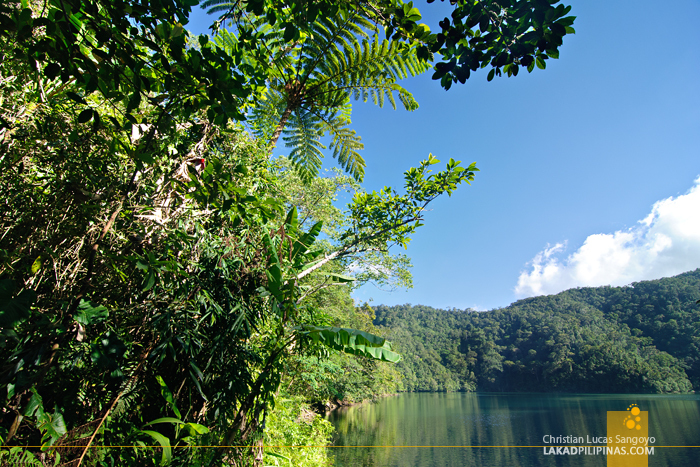 The second lake is about half the size of Lake Balinsasayao and looks to be much calmer than its counterpart. Its shore is a bit small and is littered by fallen logs. I’m pretty sure that visitors can also wade and swim here but for kayaking, I guess they’d have to haul it over the ridge as there’s no direct channel between the two lakes. Since we didn’t know that we can swim around the lake, only one of us brought a swimwear along; too bad since the water seemed really inviting. And never mind the fathomless depths of the water; life vests are available for those who’re not that good in swimming. So we simply took everything in; the view, the breeze, the sounds of birds, the serenity of the two magnificent lakes above the mountains. We took one last look and boarded our boat back to the bank of the first lake. 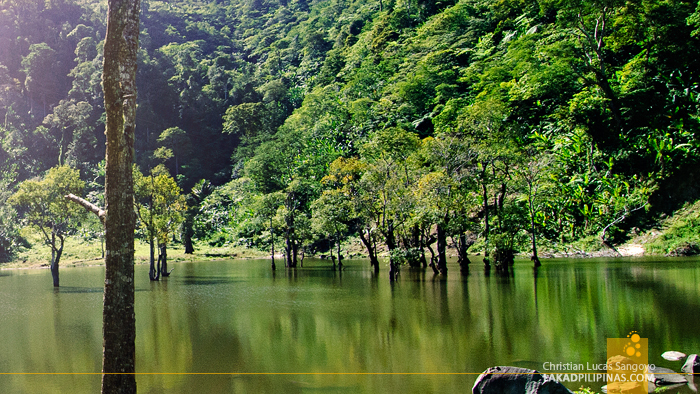 But our adventure at the Twin Lakes of Balinsasayao didn’t end there. 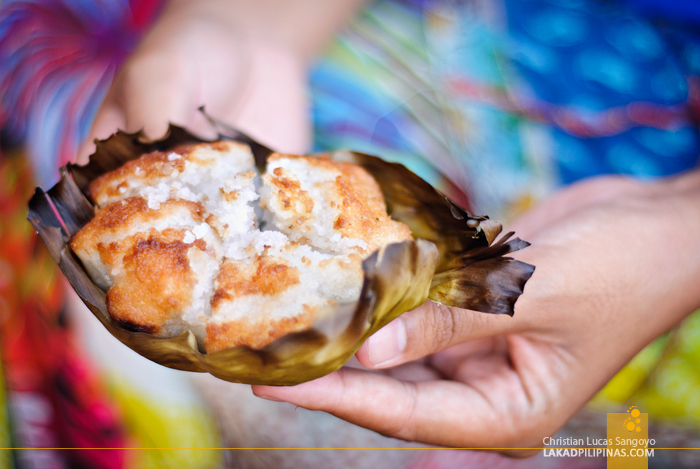 A reward awaited us as we alighted from our wooden boat, hot rice cakes made by the locals! Now that’s how you complete trip! GPS Coordinates: 9° 21' 13.37", 123° 10' 38.99"
The lake looks soooo clean! I went here in 2004 and it was just starting to be developed...we were not prepared to go there but on our way back to Bacolod, we decided to make a side trip since the driver said it was just 20 minutes going up...well that 20 minutes seemed like forever with the single lane road and really steep embankments on the way up. I was wearing medium heels so you can imagine the struggle going down to the lakes...hahahaha. But I made it down and up! Lake Balinsasayao was really breathtaking then. 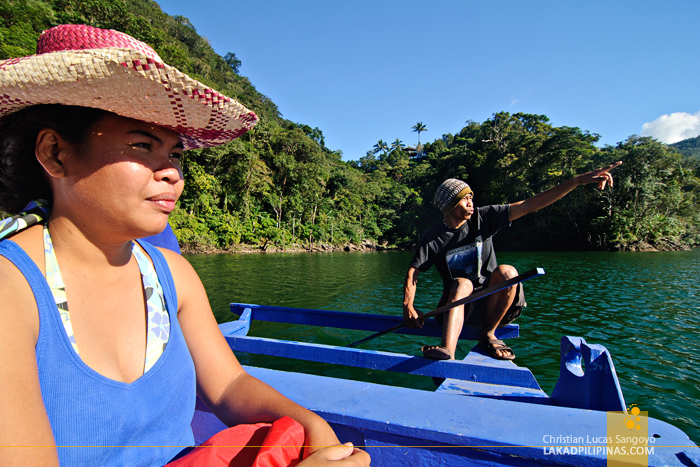 We not longer went to the other side (lake Danao). Looking at your pictures, it seems the place has improves with rest rooms and that viewing deck. In 2004, the only rest room was a hut near the lake.